One of the single most important things to remember when taking a selfie is the angle you take it from. 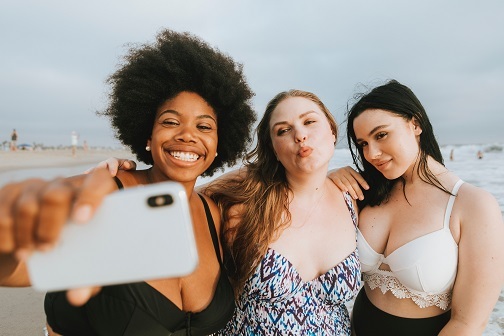 If you hold you camera low and look downwards, you’re going to capture your chin from a really unflattering angle and will make yourself look as though you have double chins, even if you really don’t. Also, when you shoot from below you’ll inevitably end up getting a picture where your nostrils dominate and that’s never a good look. If you’re using the flash on your photos, there’s a good chance it will illuminate certain areas of your face which you don’t necessarily want on show. You know that ‘sunbed goggles’ look that you sometimes see? That’s because people use heavy, too-light concealer which reflects the light of the flash. Opt for a mineral base like Dermalogica Sheer Tint SPF20 which gives a matte wash of colour and won’t reflect on pictures. Obviously, the best smile is a natural one, but it’s hard to capture that in photos which aren’t candid. If you’re over twenty, an exaggerated pout isn’t going to flatter you, nor is a massive wide smile, unless you’re Julia Roberts! Opt for a half-smile, which will look pretty but won’t distort your face and use Dermalogica Multivitamin Power Firm to ensure you don’t have fine lines around your mouth. If you’re getting more than just your face in your selfie, you’ll want to think about what to do with your arms. If you keep your arms pressed against the sides of your body, that’s going to squish them out and make them look a lot bigger than they are, so opt for a hand on the hip or similar, and use Decleor Body Firming Oil-In-Cream for firmer skin. If you’re worried about a not-so-firm jawline, then obviously we’d recommend Elemis Pro-Definition Night Cream, which will firm jowls. However, if you need a quick fix for an impromptu selfie, then try to pose with a hand under your chin, or angle your hair to create a distraction.